William Warham, Archbishop of Canterbury, belonged to a Hampshire family, and was educated at Winchester and New College, Oxford, afterwards practicing and teaching law both in London and Oxford. Later he took holy orders, held two livings, and became master of the rolls in 1494, while Henry VII found him a useful and clever diplomat. 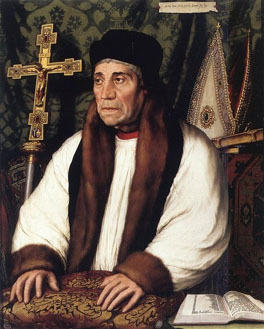 He helped to arrange the marriage between Henry's son, Arthur, and Catherine of Aragon; he went to Scotland with Richard Foxe, then bishop of Durham, in 1497; and he was partly responsible for several commercial and other treaties with Flanders, Burgundy and the German king, Maximilian I. In 1502 Warham was consecrated bishop of London and became keeper of the great seal, but his tenure of both these offices was short, as in 1504 he became lord chancellor and Archbishop of Canterbury. In 1509 the archbishop married and then crowned Henry VIII and Catherine of Aragon, but gradually withdrawing into the background he resigned the office of lord chancellor in 1515, and was succeeded by Thomas Wolsey, whom he had consecrated as bishop of Lincoln in the previous year. This resignation was possibly due to his dislike of Henry's foreign policy. He was present at the Field of the Cloth of Gold in 1520, and assisted Wolsey as assessor during the secret inquiry into the validity of Henry's marriage with Catherine in 1527. Throughout the divorce proceedings Warham's position was essentially that of an old and weary man. He was named as one of the counsellors to assist the queen, but, fearing to incur the king's displeasure and using his favorite phrase ira principis mors est, he gave her very little help; and he signed the letter to Pope Clement VII which urged the pope to assent to Henry's wish. Afterwards it was proposed that the archbishop himself should try the case, but this suggestion came to nothing. He presided over the Convocation of 1531 when the clergy of the province of Canterbury voted £100,000 to the king in order to avoid the penalties of praemunire, and accepted Henry as supreme head of the church with the saving clause "so far as the law of Christ allows." In his concluding years, however, the archbishop showed rather more independence. In February 1532 he protested against all acts concerning the church passed by the parliament which met in 1529, but this did not prevent the important proceedings which secured the complete submission of the church to the state later in the same year. Against this further compliance with Henry's wishes Warham drew up a protest; he likened the action of Henry VIII to that of Henry II, and urged Magna Carta in defense of the liberties of the church. He died on the 22nd of August 1532 and was buried in Canterbury cathedral. Warham, who was chancellor of Oxford University from 1506 until his death, was munificent in his public, and moderate in his private life. As archbishop he seems to have been somewhat arbitrary, and his action led to a serious quarrel with Bishop Foxe of Winchester and others in 1512.